It’s really, finally, truly, seriously-not-kidding, actually happening: reversible USB connectors are on the way. The USB Type C connector, a small connector that looks a bit like Apple’s Lightning cable, was ratified back in mid-2014. But we haven’t seen any electronics adopt Type C yet; it typically takes months, if not years, for specifications ratified by the USB Implementers Forum to make it into real products. They’re finally coming in 2015. 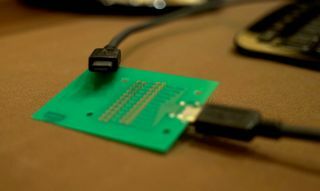 At this year's CES, we checked out a Type C cable plugged into a prototype circuit board and talked to the USB IF about when we'll start seeing the reversible connector show up in real hardware. We also saw a computer set up with USB 3.1, which raises USB’s total data bandwidth from 3.0’s 5 gigabits per second to 10 gigabits per second. As if USB wasn’t already having a good enough day, we heard about another recently ratified standard: power over USB increasing up to 100 watts. USB cables have been carrying power for years, but the interface has never been rated to feed devices more than 10 watts. That’s why you can charge a smartphone over USB, or a tablet, with a larger power module. But a laptop? No way. Until now. The new Power Delivery spec allows for 100 watts of of power over USB, enough to charge laptops and just about any other personal electronic device you can think of. For our daily use of USB, though, we’re more excited about the Type C connector. No more fumbling with a USB plug, getting it wrong, flipping it over, somehow getting it wrong again, and then flipping it back to the original orientation which was, apparently, actually right the first time. The plug is smaller, so it’s suited to a wider variety of devices, especially thin laptops. USB representatives pointed out a common misconception about the format, which may confuse some people when USB Type C debuts. The cable itself, and the plug type, don’t determine what USB is capable of. USB Type C isn’t faster or slower or capable of handling more power than the ubiquitous Type A. It’s simply a new pipe to carry power and data. USB’s performance is determined by the hardware at each end of the cable: the controller and other circuitry in the host device (like your PC) and client device (like a mouse or external hard drive). USB 3.1, which allows for 10 gigabit transfer speeds, is just starting to appear in some devices at CES. One of the MSI’s upcoming laptops will have USB 3.1, and the USB Implementers Forum was demonstrating an unfinished USB 3.1 board putting up some seriously impressive transfer speeds with a pair of SSDs in RAID. And this isn't finalized hardware, so USB 3.1 should be able to crack the 1 gigabyte barrier. 800 megabyte per second write speeds over USB? We'll take it. The first phone USB Type C debuts in will unfortunately be using USB 2.0 (remember, that’s due to the controllers, not the connector type), and we don’t know how long it will be until Type C replaces the classic Type A plugs in smartphone cases, or when we’ll see USB 3.1 integrated into motherboards. Late 2015 is probably the earliest either of those things will happen. But the good news is that Type C cables will come in C-to-A configurations, C-to-micro USB, and so on. That should help the new connector spread while ensuring compatibility with the bajillion USB A ports out there. And in another few years, if we all say very nice things about USB Type C, maybe we can finally say goodbye to the hateful rectangle that’s been with us oh so long. The future of USB starts in 2015. Be excited.